Sometimes called Japanese pizza, Okonomiyaki お好み焼き means ‘grilled how you like it’. 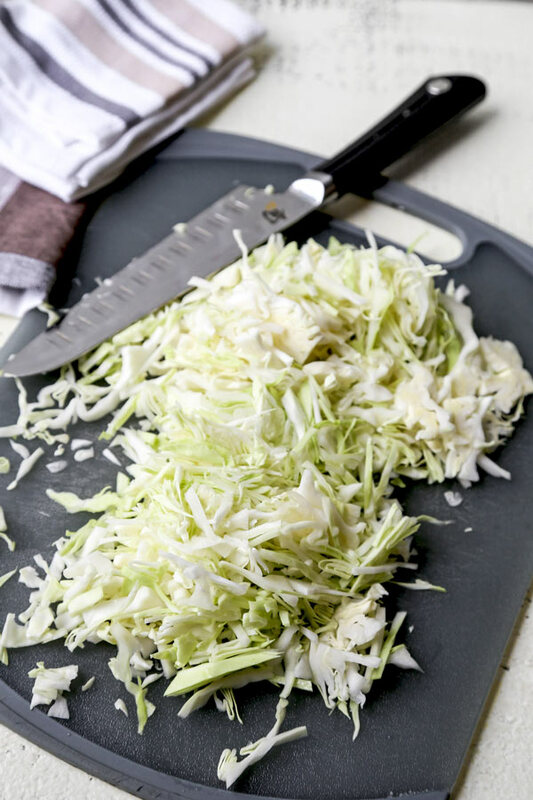 Introduce your kids to cabbage with this yummy and easy Okonomiyaki Recipe. Ready in just 20 minutes from start to finish! “That’s it!” I shouted the first time I successfully made okonomiyaki in my home kitchen. I took a second bite, so relieved that I had finally gotten it right. You see, okonomiyaki is more than just a savory Japanese pancake to me. It’s a flavor link to all those magical summers I spent with family in Japan as a kid. And, later, to the years I spent living and working in Tokyo and Yokohama. I’ll never forget the first time I tried okonomiyaki. We were all in a town called Beppu, known for their bucolic hot springs. My uncle Ken took my brother and me to a proper okonomiyaki spot. We were utterly spellbound as he worked the grill, adding batter and flipping like an absolute boss. Many, many Japanese pancakes were made and devoured that evening. I can’t remember ever being so full after a meal – or ever having my mind so thoroughly blown by food. So it stands to reason that both the taste and ritual of preparing okonomiyaki have become synonymous in my mind with Japan itself. The mixture of flavors and textures do wonders for my homesickness. And, I’d say it’s pretty rare for a remedy to taste this good! Okonomiyaki – お好み焼き – is a savory Japanese pancake made with a light but substantial batter made of flour, mountain yam and dashi. 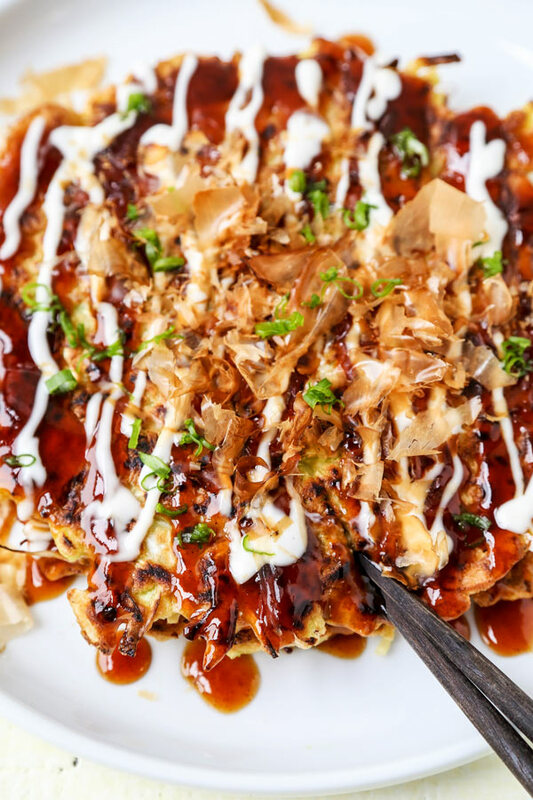 Sometimes referred to as a Japanese pizza, it’s quite common for one okonomiyaki recipe to differ greatly from another from an ingredients standpoint. You see, okonomiyaki has a tradition of being topped with okonomi sauce, Japanese mayonnaise, katsuobushi and pickled red ginger. But when it comes to the ingredients inserted into the batter, it’s a different story. Some recipes include pork belly, others use seafood or a fried egg – and others yet use more eclectic ingredients like mochi or even cheese! And the freedom to use those different ingredients is even reflected in the meaning of the name. So, what does okonomiyaki mean then? Sure, the name is a mouthful to pronounce! But the word okonomiyaki derives from two words in the Japanese language. Okonomi means roughly ‘how you like’. Therefore, grilled how you like it isn’t too far off. That’s a pretty appropriate translation considering there are a TON of different okonomiyaki combinations. I even sometimes make permutation without batter. Check out my eggy okonomiyaki style omelet recipe here. In fact, it bears mentioning… there are no hard and fast rules on what you can’t use in these savory Japanese pancakes. When it comes to preparing an okonomiyaki recipe: if it grills, it goes! For this homemade Japanese pancake recipe, I’m using dashi in place of water when I mix up my okonomiyaki batter. Dashi is a Japanese sea stock that acts as the savory, umami bedrock in so many Japanese recipes. 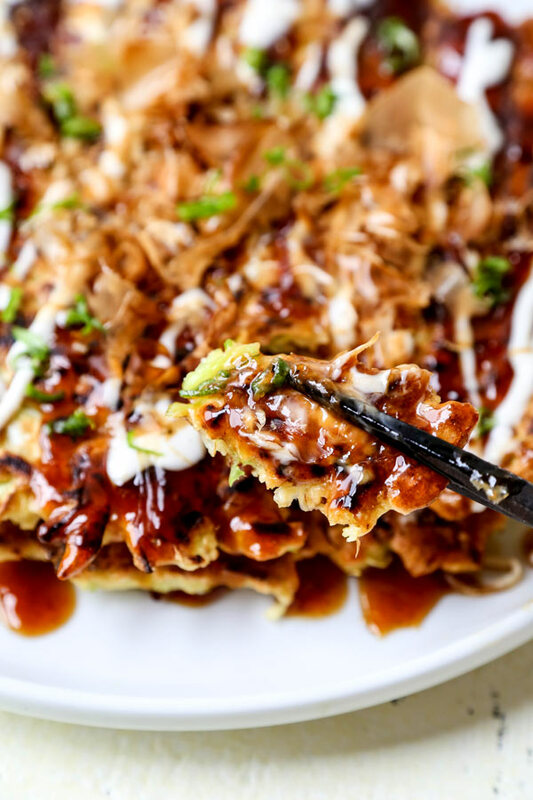 And it just happens to crank up the flavor in this easy okonomiyaki recipe to 11! It’s a fantastic flavoring tool to keep handy in the fridge. Check out my simple tutorial on how to make dashi here. 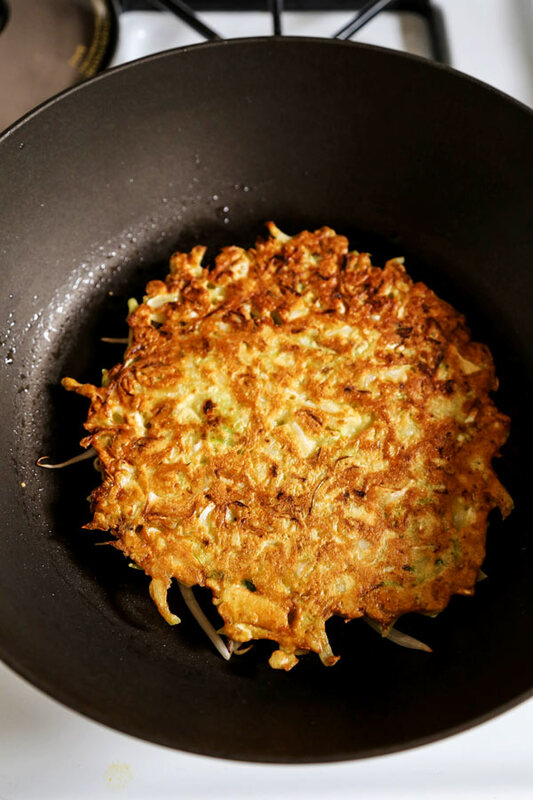 Now, you’re likely to find many of the ingredients you’ll need to whip up your own Japanese cabbage pancake at your neighborhood grocery store. I’m here to say that I love Japanese mayo – but it’s not a deal breaker for me. If I’m out – and I plan on making this sprout loaded Japanese savory pancake recipe – you better believe I’ll be using whatever mayo I have handy in the fridge! And, here’s a bit more good news on the sauce front! No okonomi sauce on hand? No problem. Tonkatsu sauce is super easy to make at home. And you can totally use a tangy tonkatsu sauce in place of okonomiyaki sauce. Just four common pantry ingredients – and ready in under two minutes! Check out my easy recipe for homemade tonkatsu sauce とんかつソース here. So, without further ado, let’s make okonomiyaki! 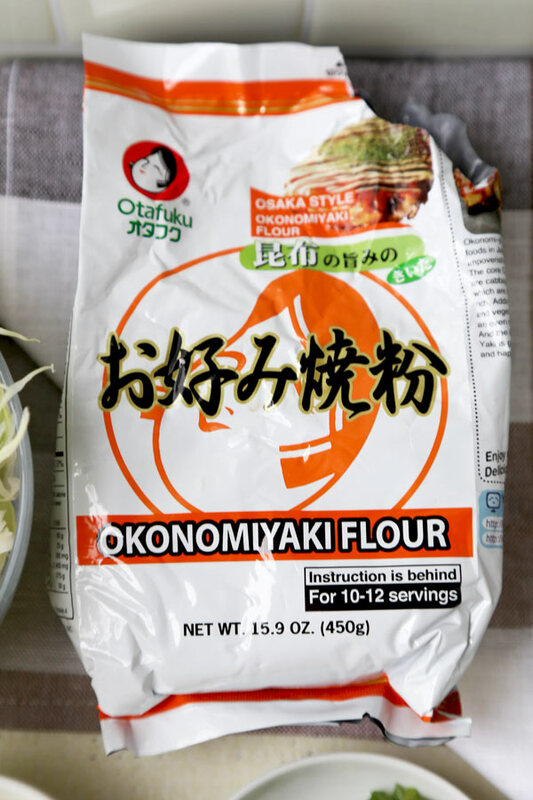 To make enough batter for about three decent sized Japanese pancakes, I like to mix one cup of Osaka style okonomiyaki flour with about ¾ cup dashi. Stir really well until the flour dissolves. Then add a couple chopped green onions, two whisked eggs and about 10-ounces or so of shredded green cabbage. Mix that well, and let’s move on to the fun part: heating it all up! Get a large pan going over medium high heat, and add a tablespoon of oil to coat the surface of the pan. Now, ladle one third of your okonomiyaki batter mixture into the pan and shape it into a pancake that is around a half-inch thick. At this point, simply place a third of a cup of fresh bean sprouts on top and let it cook for around four minutes. The bottom of your Japanese pancake should be golden brown. If that’s the case, flip it! Now your bean sprouts are on the bottom – and they should cook pretty quickly along with the other side of the pancake. Pull it off the heat after about three minutes. 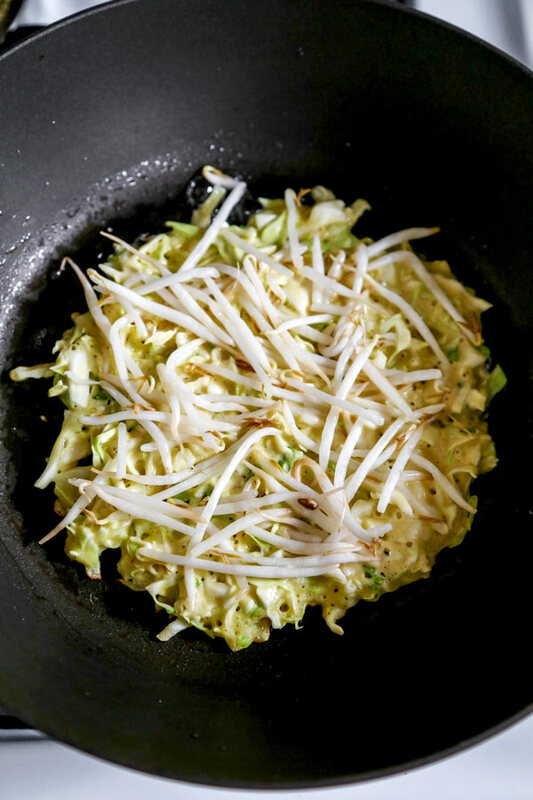 You can repeat the preceding steps with your remaining okonomiyaki batter and sprouts. When it comes to topping your Japanese pancakes, give each some Japanese mayo, okonomi sauce and katsuobushi. Oh – and don’t forget the pickled ginger! There’s a nice pliable crunch from the cabbage and bean sprouts. The pancake itself is equal parts crispy on the outside – and chewy on the inside. Oh – and that sauce!! Okonomiyaki sauce has a sweet and salty tang to it that plays ever so nicely with the creaminess from the mayo and the umami depth from the bonito flakes. 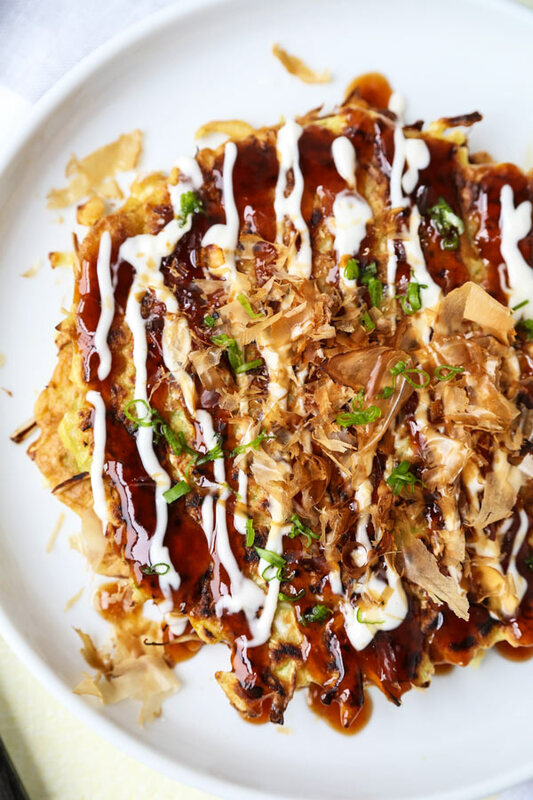 Okonomiyaki ticks ALL the boxes when it comes to flavor! Where does okonomiyaki come from? While okonomiyaki is found all throughout Japan, the most common form originated in the Kansai region around Osaka. Osaka okonomiyaki is typically made from batter that has the vegetable, meat or seafood elements mixed in. The Japanese pizza we’re making today is based on the Kansai (Osaka) style preparation. However, there is a second method at you may be familiar with. And that method hails from Hiroshima. 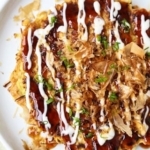 Hiroshima okonomiyaki relies on most of the same basic ingredients as the Osaka version – however with Hiroshima-yaki, everything is layered. You’ll typically find the ingredients piled one on top of the other in a neat, circular stack. Now, while I love eating both versions of okonomiyaki recipes, when it comes to cooking okonomiyaki at home, I prefer the Osaka version simply because it’s easier to execute. 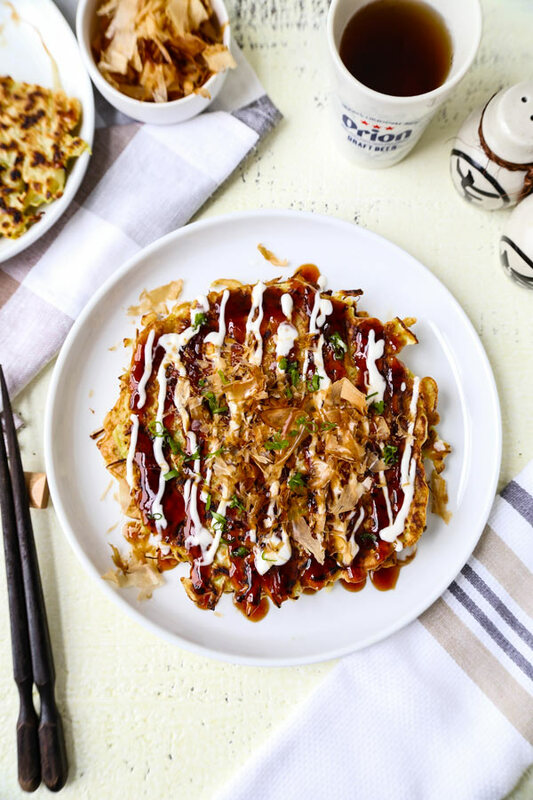 Making this homemade okonomiyaki recipe is super fun and easy. With a little practice, you’ll be an absolute pro. Bonus: dinner parties at your house might just gain a theatrical element from now on! If you pick up a Japanese grill pan, you could set it in the center of the table and wow your guests with your amazing Japanese grilling skills! Much like my uncle impressed my brother and me with his Japanese pancake flipping acumen all those years ago. 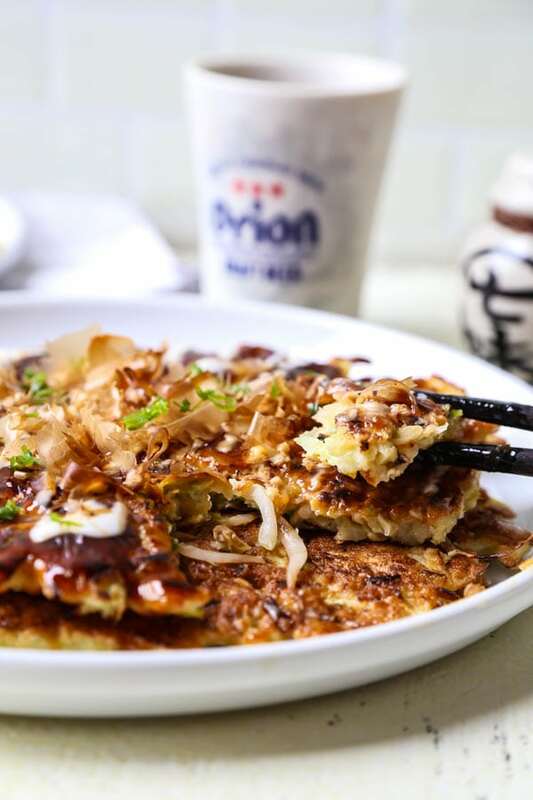 But, even if you’re just whipping something up for yourself before you binge watch hours upon hours of Terrace House, okonomiyaki makes a delicious dinner that can pull double-duty as a tasty reminder of home. What about you? What do you make in your home kitchen that transports you to the first time you ate it? I’d love to hear about it in the comments! 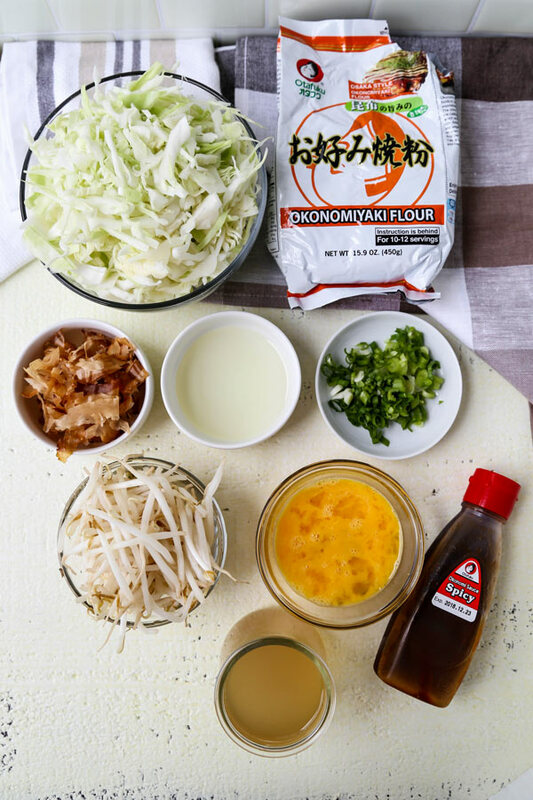 Did you like this Okonomiyaki Recipe? Are there changes you made that you would like to share? Share your tips and recommendations in the comments section below! Japanese pub food fare you can make at home! In a large bowl, add okonomiyaki flour and stir in the dashi broth until the flour dissolves. 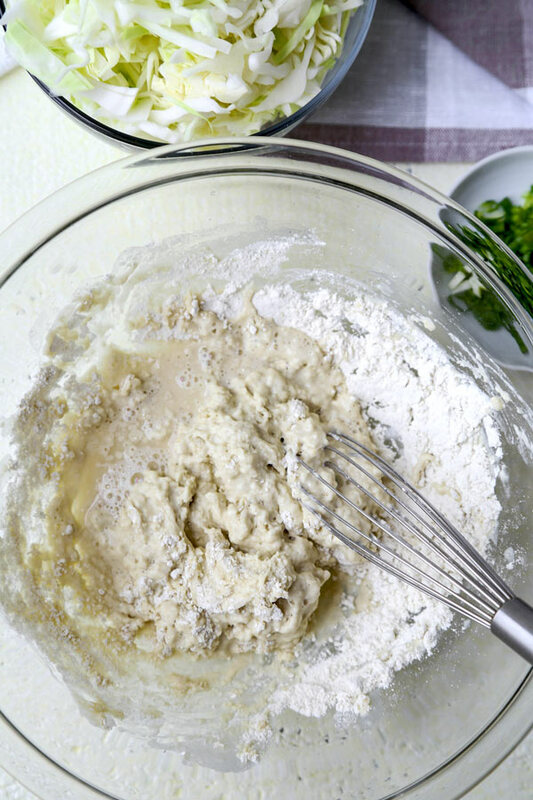 Add cabbage, green onions and eggs to the batter and mix well. In a large pan over medium high heat, add 1 tablespoon oil and swirl to coat the pan. Pour 1/3 of the mixture into the pan and shape into a 1/2-inch thick pancake. Top with 1/3 of the bean sprouts and cook for 4 minutes, until the bottom is golden brown. Flip the pancake and cook for 3 minutes, until bean sprouts are cooked. Transfer to a plate and top with okonomiyaki sauce, mayonnaise, bonito flakes and pickled ginger. Repeat the steps for the remaining 2 pancakes. This pizza looking colorful and delicious. Procedure is also simple. Nice recipe.